7 Things You Should Add to Your Stop Doing List...Right Now! - Something New Everyday! Home Unlabelled 7 Things You Should Add to Your Stop Doing List...Right Now! 7 Things You Should Add to Your Stop Doing List...Right Now! 1. Making Excuses. Successful people do not blame others or make excuses or complain about their bad luck. They take full responsibility for their lives. They know that success and failure lie in their hands. So stop being a victim, stop whining and stop making excuses. drift through life hoping for the best. They set goals and then set about achieving them. If you approach each day in a happy go lucky way then stop. Stop drifting and start planning. Develop a vision of a successful you. List what you have to do to get there. Plan your work then work your plan. 3. Sitting in Front of a Computer All Day (or worse still…a TV). Sure there are some important things you can do sitting at your screen but do not spend all day there. Get out and meet people, network, learn. Do things with the people you want to lead or help or do business with. 4. Putting Things Off. Procrastination is the enemy of success. 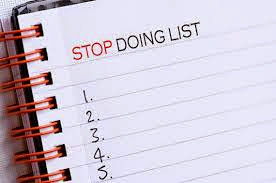 Decide on your objective, list out the tasks you have to complete, prioritize them and then get on with the top ones. We all suffer the temptation to put off the jobs we fear or dislike. Bite the bullet. Eat the frog. Do the job. 5. Just the Easy Stuff. Which tasks do you spend most time on? The important, the urgent, the easy or the routine? If you spend most of your time on easy or less important tasks then stop. You should focus first on the most important jobs, the ones that will move you towards your strategic objective. You should delegate or ignore the low value activities. 6. Sitting in Ineffective Meetings. Do you waste time at work in low-value meetings? Most office workers do. Every meeting should have a clear purpose, an agenda and a skilled chairperson who keeps the meting focussed on delivering its objectives. Do not go to poor meetings – just ask for a summary of agreed actions. 7. Limiting your Ambition. Successful people have enormous self-belief, drive and ambition. They hold themselves to high standards. Are you holding yourself back? Have you lost some of your self-belief and confidence? Start afresh. Set yourself ambitious goals. Remind yourself of your skills and achievements. Motivate yourself every day. If you can eliminate the low value activities and the negative things you do then you will free yourself to succeed. Stop doing the things that you know are wasting your time and start building your success. Clint Cora is a motivational speaker, author & Karate World Champion based near Toronto, Canada. Get his FREE 3-part Personal Development Video Series on how to expand your comfort zone and finally conquer even your most daunting goals in life.